We present a diagrammatic formulation of recently-revived covariant functional approaches to one-loop matching from an ultraviolet (UV) theory to a low-energy effective field theory. Various terms following from a covariant derivative expansion (CDE) are represented by diagrams which, unlike conventional Feynman diagrams, involve gauge-covariant quantities and are thus dubbed “covariant diagrams.” The use of covariant diagrams helps organize and simplify one-loop matching calculations, which we illustrate with examples. Of particular interest is the derivation of UV model-independent universal results, which reduce matching calculations of specific UV models to applications of master formulas. We show how such derivation can be done in a more concise manner than the previous literature, and discuss how additional structures that are not directly captured by existing universal results, including mixed heavy-light loops, open covariant derivatives, and mixed statistics, can be easily accounted for. R. Huo, Effective Field Theory of Integrating out Sfermions in the MSSM: Complete One-Loop Analysis, arXiv:1509.05942 [INSPIRE]. B. Henning, X. Lu and H. Murayama, One-loop Matching and Running with Covariant Derivative Expansion, arXiv:1604.01019 [INSPIRE]. 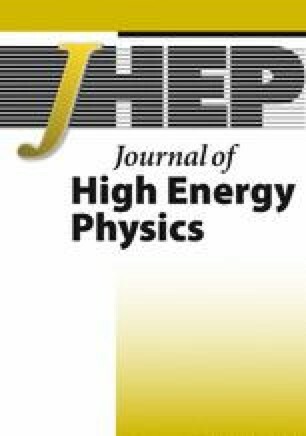 S. Dittmaier and C. Grosse-Knetter, Deriving nondecoupling effects of heavy fields from the path integral: A heavy Higgs field in an SU(2) gauge theory, Phys. Rev. D 52 (1995) 7276 [hep-ph/9501285] [INSPIRE]. S. Dittmaier and C. Grosse-Knetter, Integrating out the standard Higgs field in the path integral, Nucl. Phys. B 459 (1996) 497 [hep-ph/9505266] [INSPIRE]. M. Beneke and V.A. Smirnov, Asymptotic expansion of Feynman integrals near threshold, Nucl. Phys. B 522 (1998) 321 [hep-ph/9711391] [INSPIRE]. A. Pich, Effective field theory: Course, hep-ph/9806303 [INSPIRE]. M.S. Bilenky and A. Santamaria, One loop effective Lagrangian for a standard model with a heavy charged scalar singlet, Nucl. Phys. B 420 (1994) 47 [hep-ph/9310302] [INSPIRE]. 1.Michigan Center for Theoretical Physics (MCTP)University of MichiganAnn ArborU.S.A.